WintherStormer opened the Elektrostat festival (previously named the Oslo Synth Festival) at the "Fabrikken" ("The factory") venue in Oslo on November 9th, 2007. 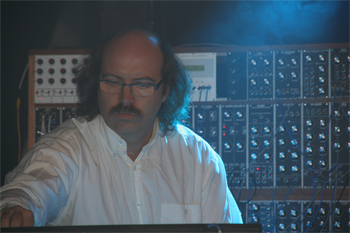 WintherStormer was invited to open the Elektrostat festival (previously named the Oslo Synth Festival) in 2007. The full band with Terje Winther (synths and sequencers), Erik Stormer (synths and sequencers), Atle Pakusch Gundersen (guitar end electronics) and Geir Marthin Helland (percussion) played a 30 minute set at the "Fabrikken" venue. With a setup of selfbuild analog modular synthesizers, exotic percussion, theremin, old synths and liquid light effects, the two 15-minutes songs provided a strong opening for this two-day festival. Some of the gear on the soundcheck. 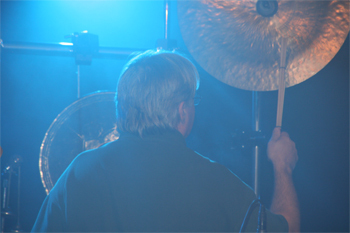 Geir Marthin Helland riding away on percussion. 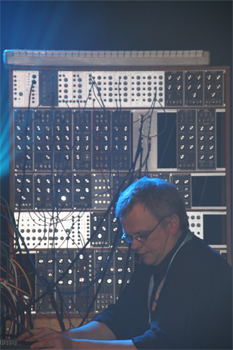 Terje Winther on minimoog with modular close behind. 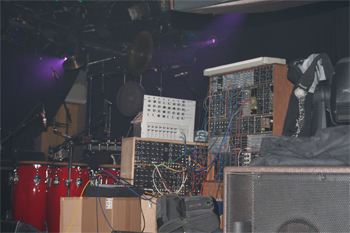 Erik Stormer with his impressive modular. 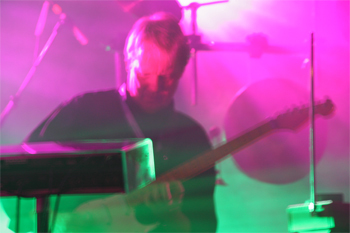 Atle Pakusch Gundersen on electronic guitar, theremin and black boxes on the liquid spotlight.